Teaching at Bead & Button 2013! Now that the catalog is out, I can tell you! 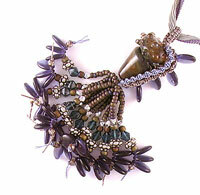 I’m teaching three classes at Bead & Button in 2013! Classes open soon for registration! I’ll also have my same booth – #410. 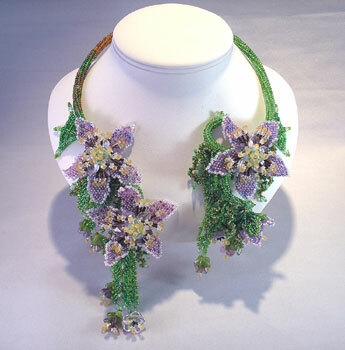 Description: Use borosilicate glass and several lampworking techniques to create detailed, lifelike floral beads. This is a perfect introduction to borosilicate glass for students who already have soft glass bead-making experience. Students will leave with several large scale floral beads. Class involves the use of a torch with open flame and gases. Wear safety (didymium) glasses, cotton clothing, and closed-toe shoes. Tie long hair back. Description: Originally used to adorn military uniforms, bridal veils, and clothing, soutache braid has made its way into the jewelry world. 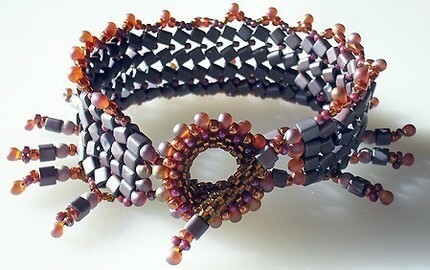 Combine braid and beads, then assemble into a soft bracelet, a hard cuff, or a fabulous barrette. Did you know that I have many of my tutorials available as a PDF? First, the legal stuff (no fun, I know, but lets just get it all out of the way): These pattern are for your own personal use. I do not give permission to teach these patterns. I also do not give permission to sell the finished pieces on Etsy. 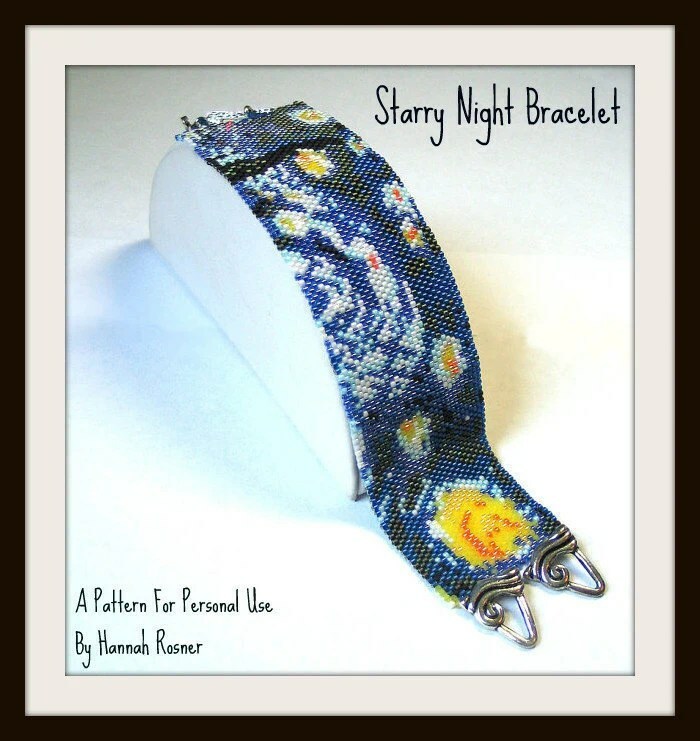 Please ask written permission if you would like the sell your finished bracelet on other venues. These tutorials are sent via email (PDF) upon receipt of payment. 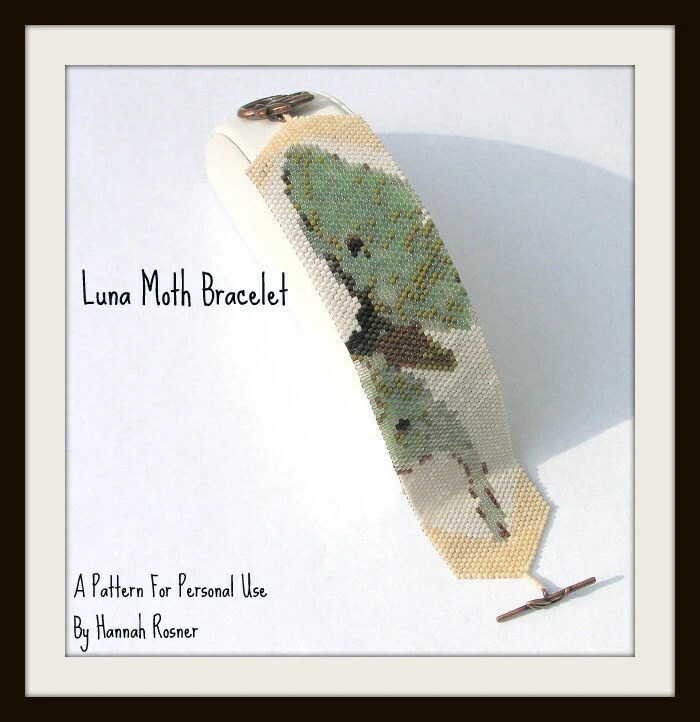 I’m sorry, if you need these patterns to be printed and shipped, then I will charge an additional fee. You are purchasing a tutorial only. 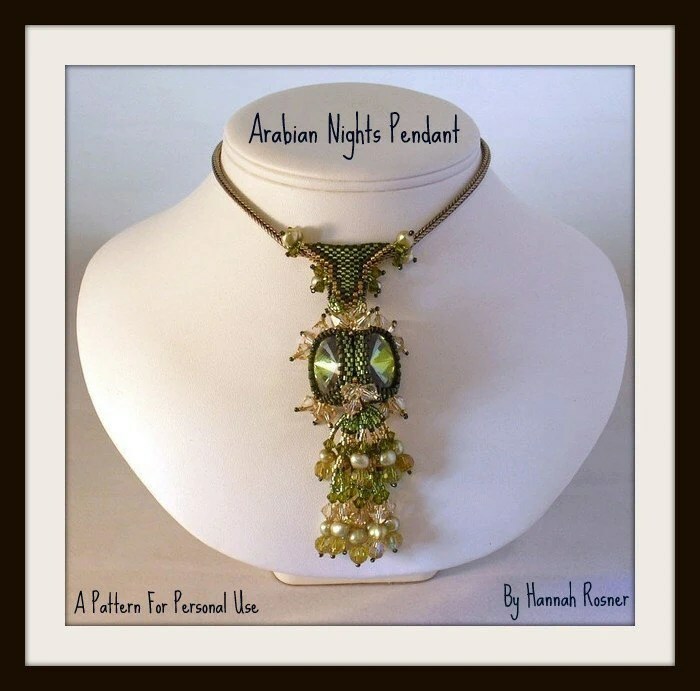 Listing does not include a finished piece of jewelry. Okay, now the fun stuff! Learn even count fast peyote stitch. Does not show you how to do fast peyote and read a graph – you’ll have to take one of my classes for that! You need to already know even count regular peyote stitch for this. These pattern are for your own personal use. I do not give permission to teach these patterns. I also do not give permission to sell the finished pieces on Etsy. 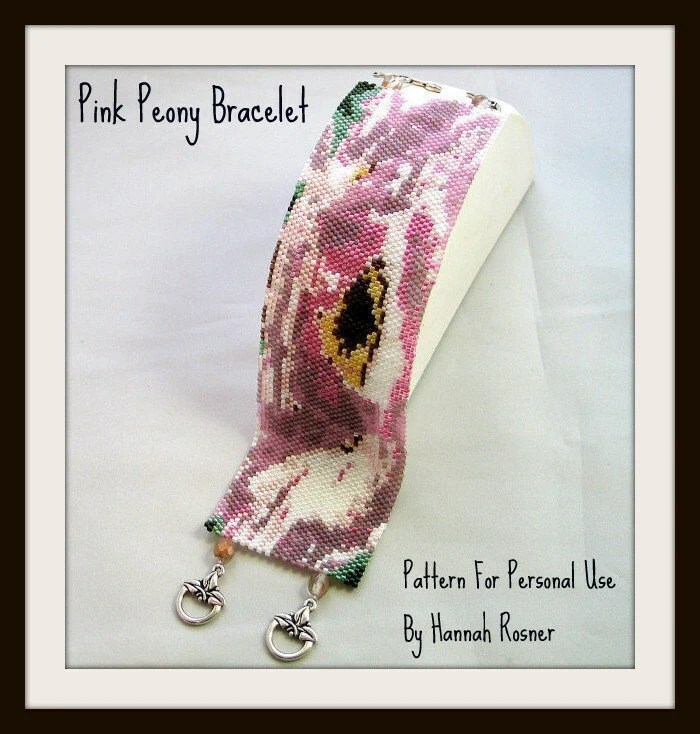 Please ask written permission if you would like the sell your finished bracelet on other venues. These tutorials are sent via email (PDF) upon receipt of payment. I’m sorry, if you need these patterns to be printed and shipped, then I will charge an additional fee. You are purchasing a tutorial only. Listing does not include a finished piece of jewelry. 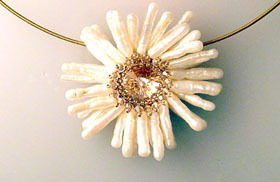 A three-sided pendant covered in crystals and/or pearls. Students need to have a working knowledge of peyote stitch in the round and be well versed in bead weaving. Students also need to know how to do even count flat peyote stitch and read a peyote graph. 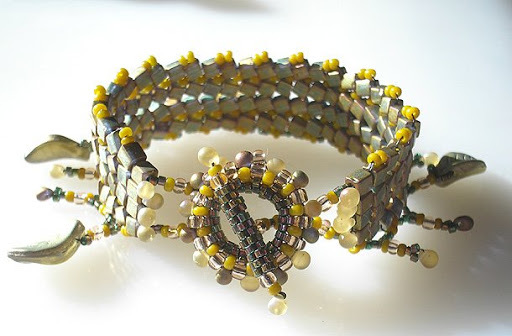 Use crystals and seed beads to make your own version of this handbeaded bracelet. Previous peyote stitch experience necessary. 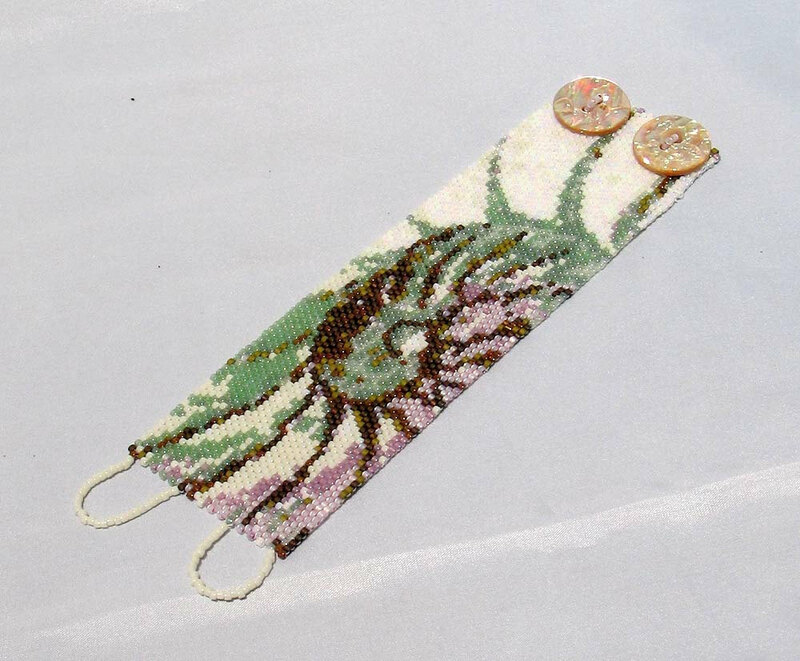 This pattern looks very similar to a project in the 2011 October edition of Bead and Button. Mine is done in peyote stitch; the Bead & Button one is done in right angle weave. I taught my Atlantis Bracelet first a year and a half before hers appeared. 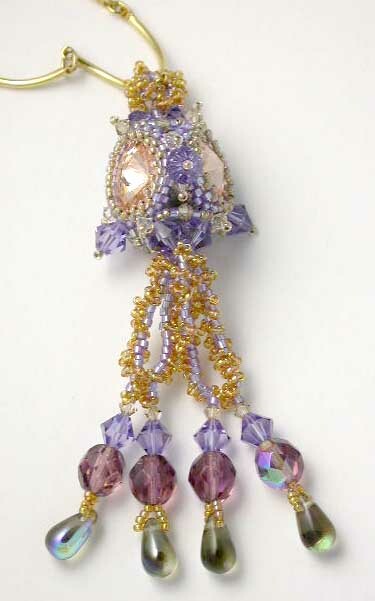 Make this little beaded tri-sided bead, using Swarovski Rivolis as your base. 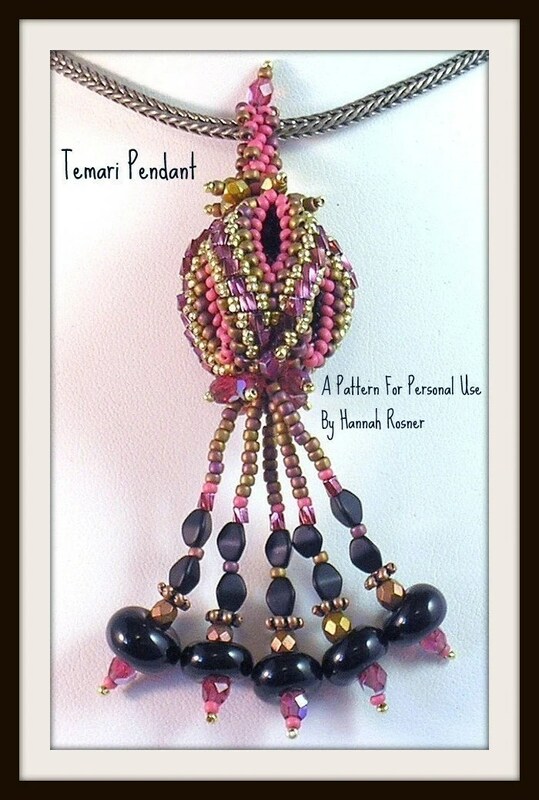 Add an optional fringe to make it into a pendant.Students SHOULD BE ALREADY FAMILAR WITH FLAT EVEN COUNT PEYOTE STITCH before they begin this project and know how to read a peyote beading graph. 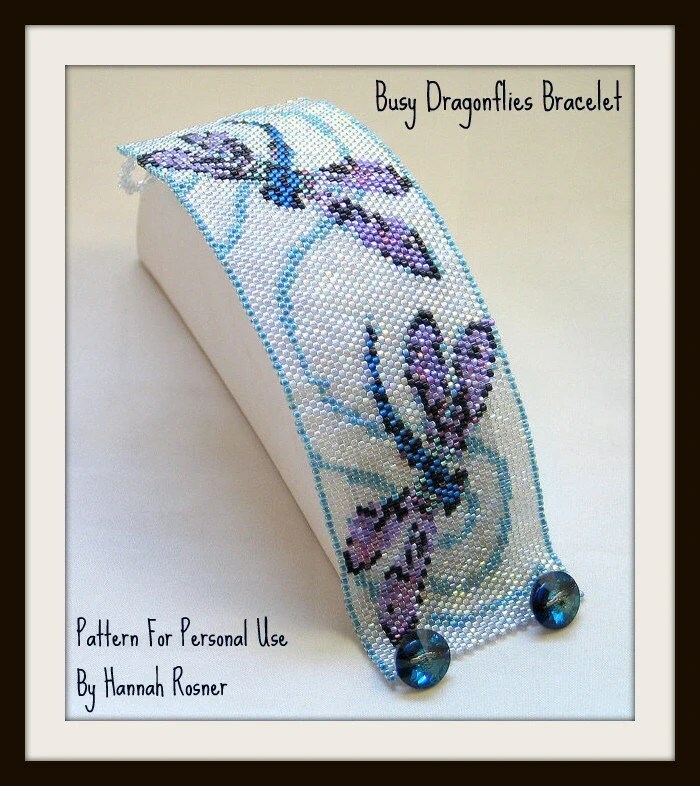 This 60+ page tutorial is mainly geared toward the seed beader, but has useful information for any beader or beadmaker. A heavy dose of how to design and recognize a “good” palette with a sprinkling of information on seed bead sizes, shapes and finishes. 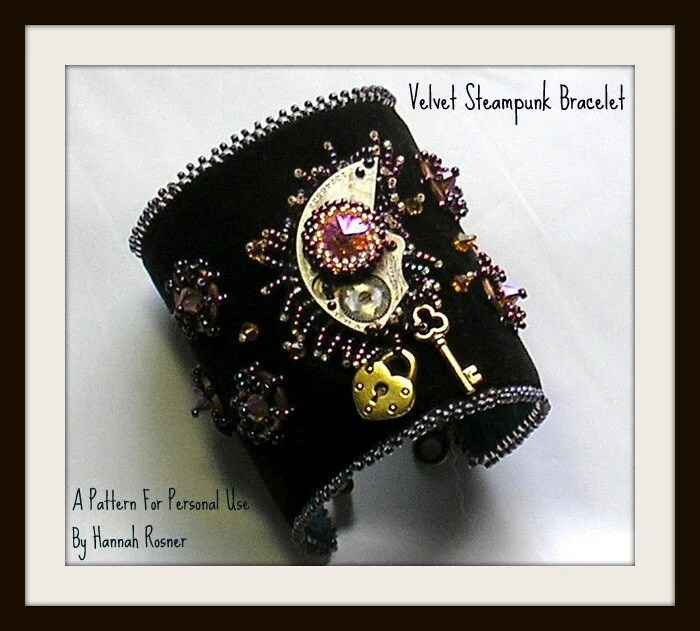 This faceted steampunk style bracelet is just even count peyote stitch, but you have to keep a sharp eye on the beads to get it to facet correctly. That’s the only reason I have it listed at the level it is. Students need to be really comfortable with peyote stitch. 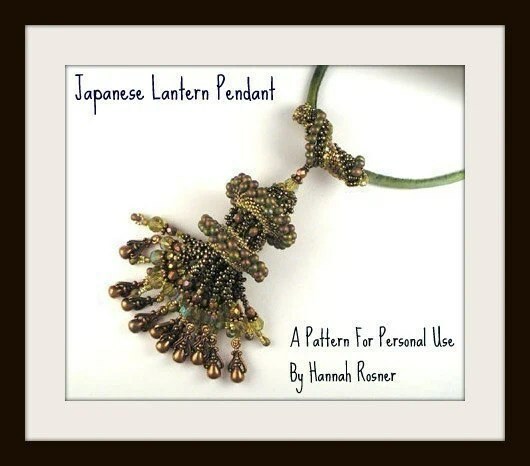 Use Japanese beads, Czech glass beads, pearls &/or Swarovski crystal to make your own version of this pendant. 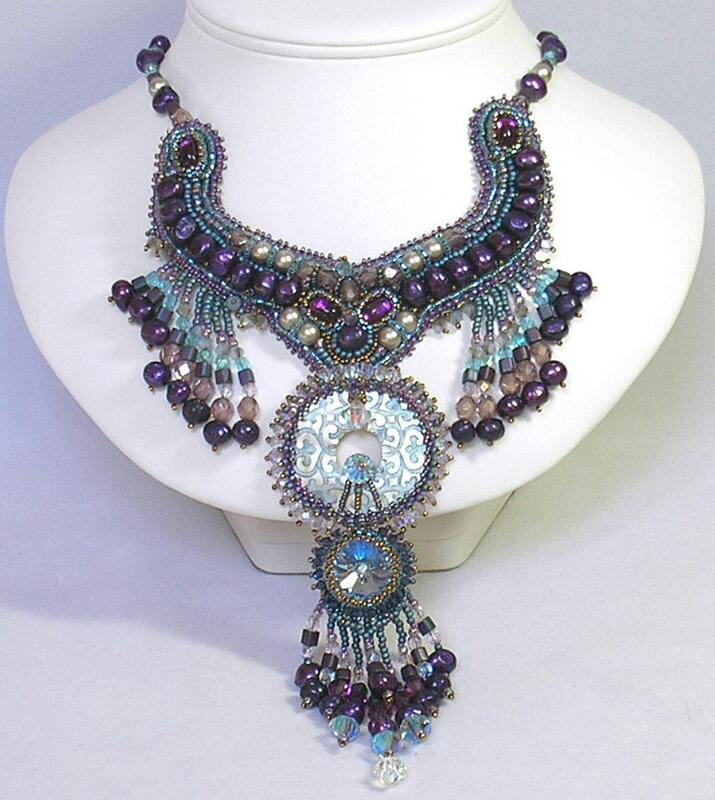 Combine a beaded cabochon and tons of fringe to make this wide collar. Comes with an additional fringing tutorial. 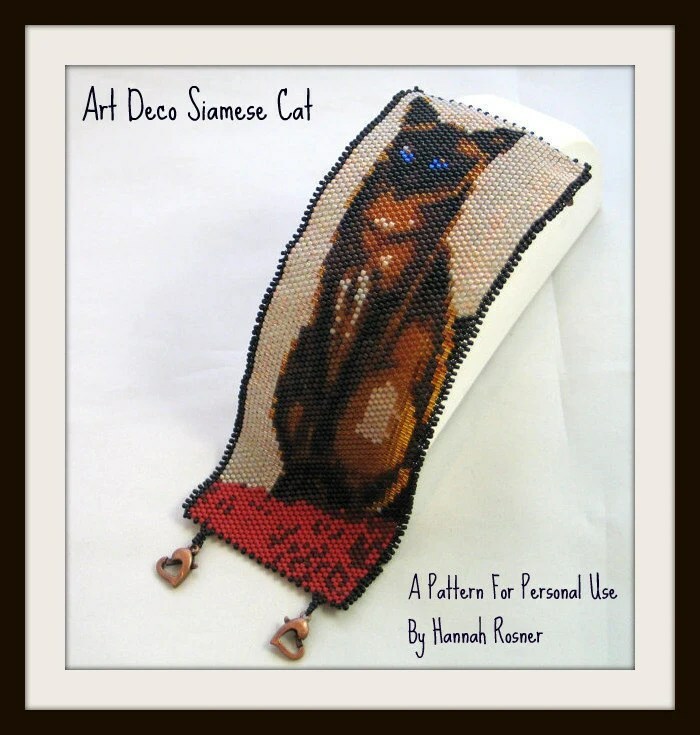 This project is actually all-levels and teaches basic bead embroidery, but I’ve placed it here in the intermediate section because the beads and form can make for a pricey piece. Since you will be covering the whole form with beads, you actually will have a pretty good time committment. 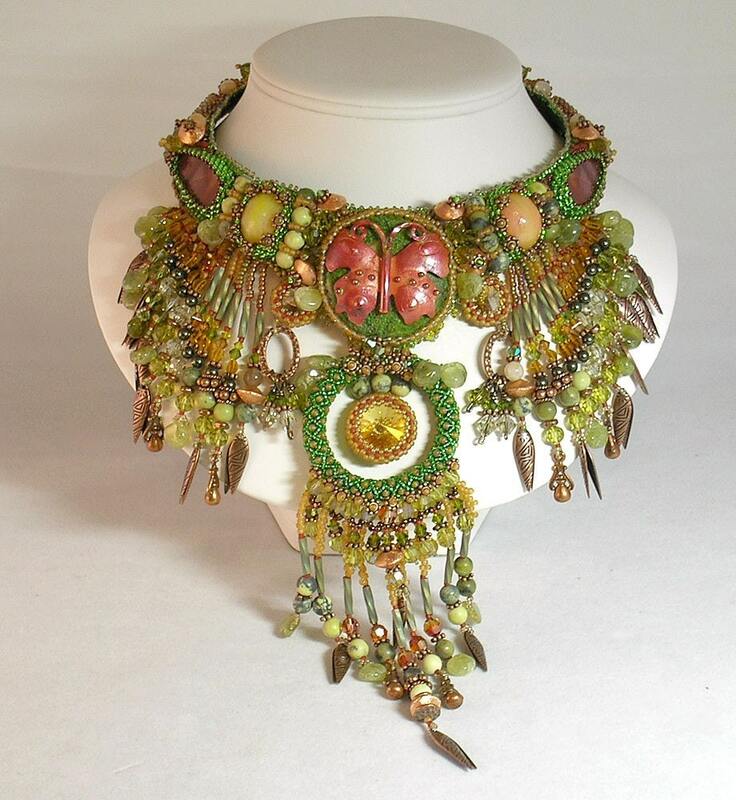 Combine a netted lariet necklace with some ruffled beads, fringe and a ruffley cabochon. 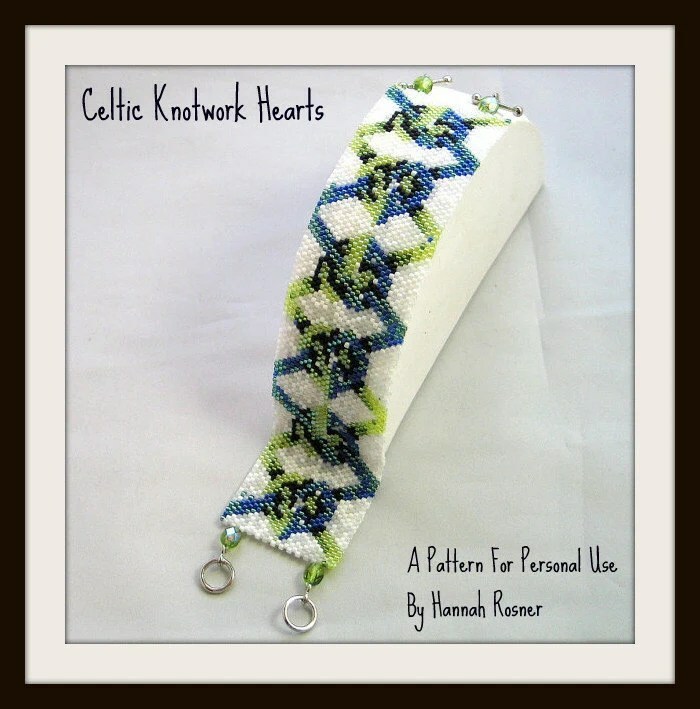 You should know even count flat peyote stitch before you try this project. Fashion an over the top neckpiece using three different beading techniques, all based off of peyote stitch. 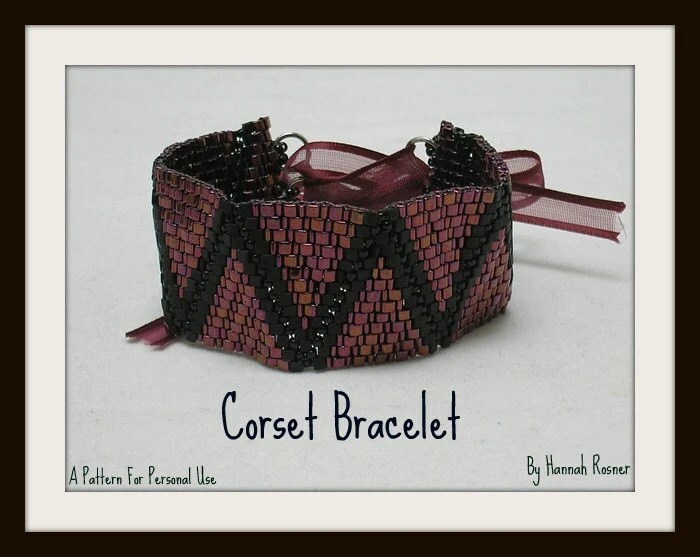 Students need to be really comfortable with peyote stitch before they try this project. 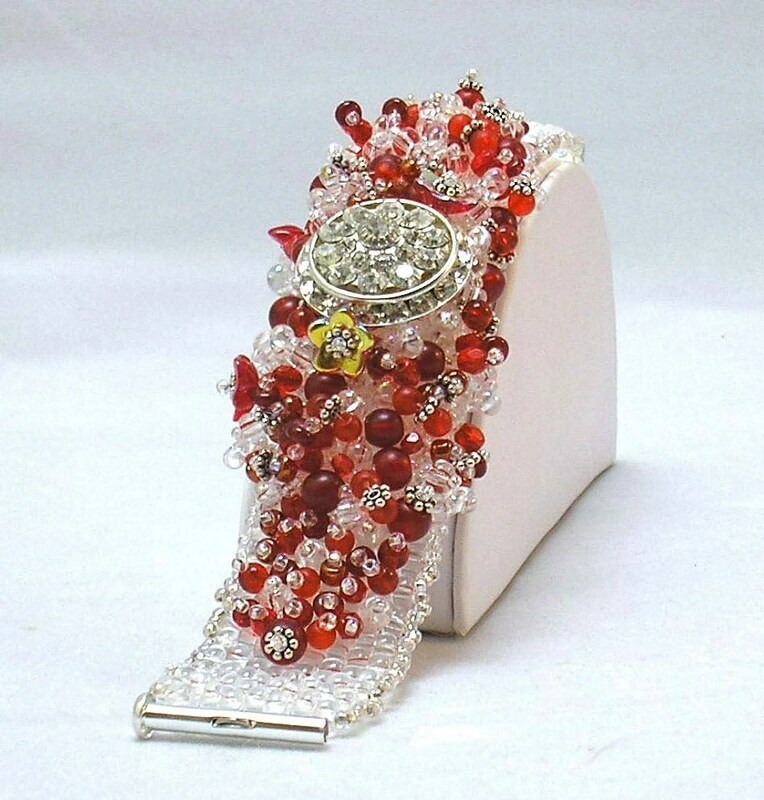 Use size 8/0 seed beads, crystals and lampwork beads to make this lush bracelet. A micromacrame project that teaches you the very basics of the stitch but I’ve rated this as an intermediate project because it takes a significant amount of time. 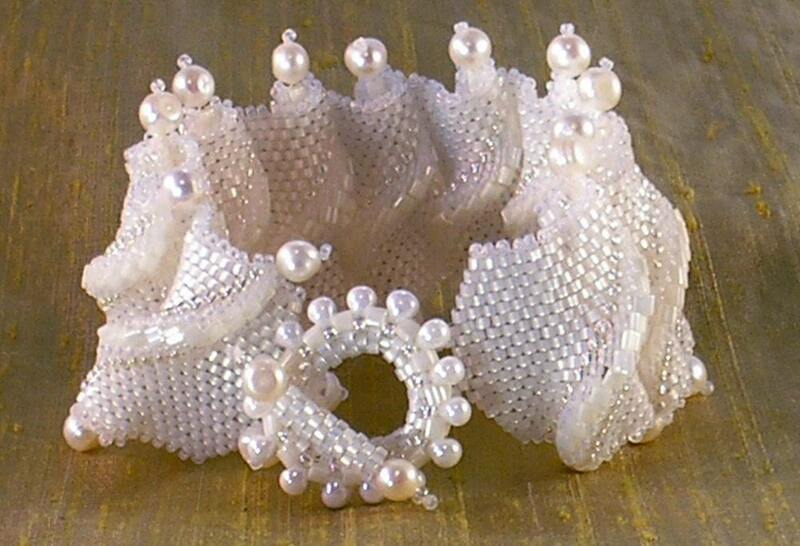 Use size seed beads & crystals and lampwork beads to make this bracelet. Begins with basic ndebele, then we add texture and components, one at a time. 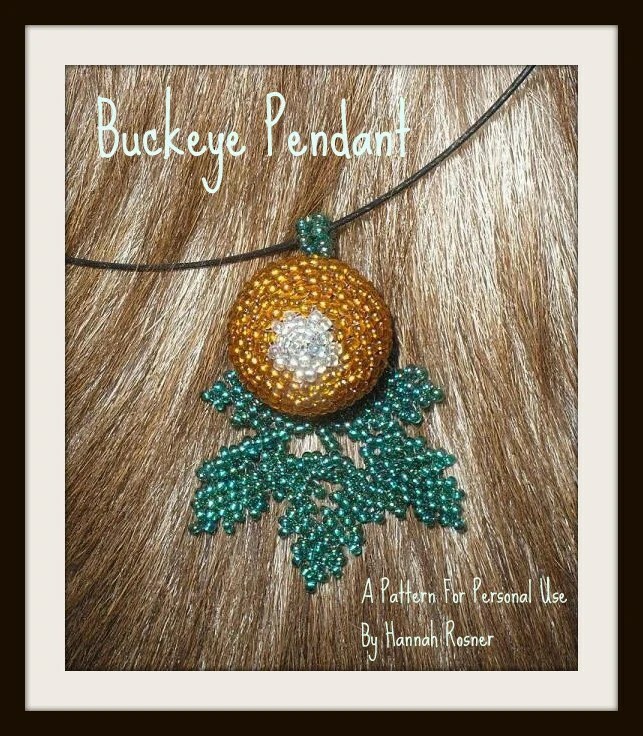 Use seed beads and peyote stitch to make this Ohio State football team inspired pendant. Students need to already known even count flat peyote to make this project. 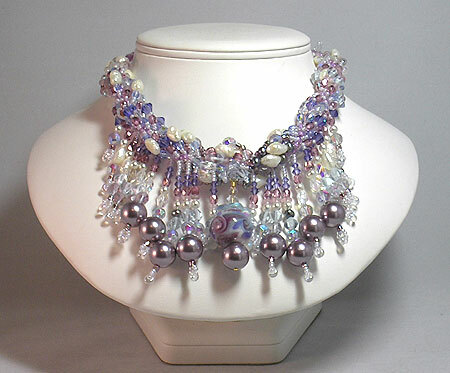 Use seed beads, Swarovski crystal & Czech pressed glass to make your own version of this necklace. 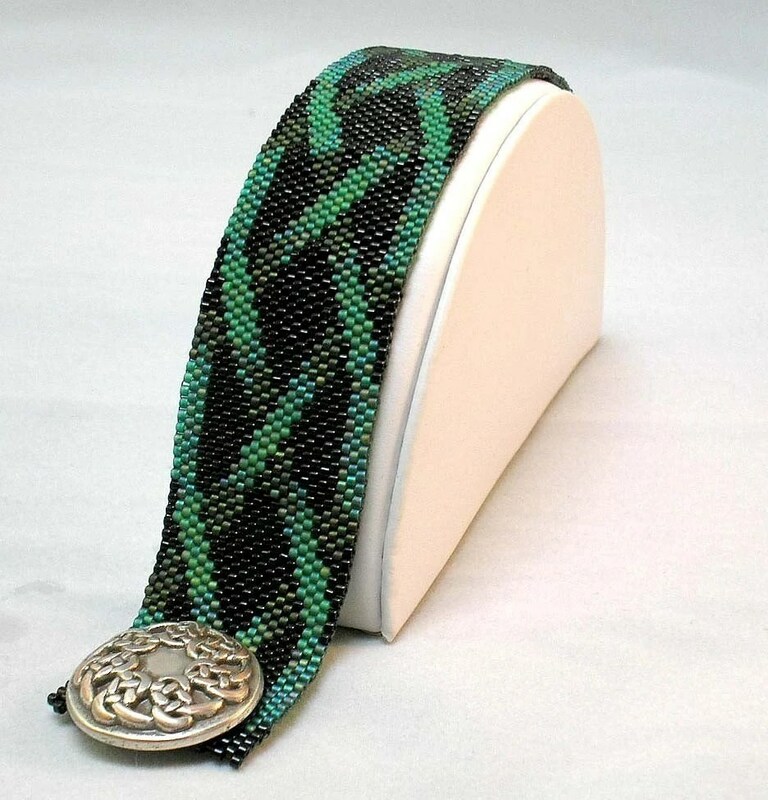 Students need to know peyote stitch, ndebele stitch and right angle weave to complete this project. 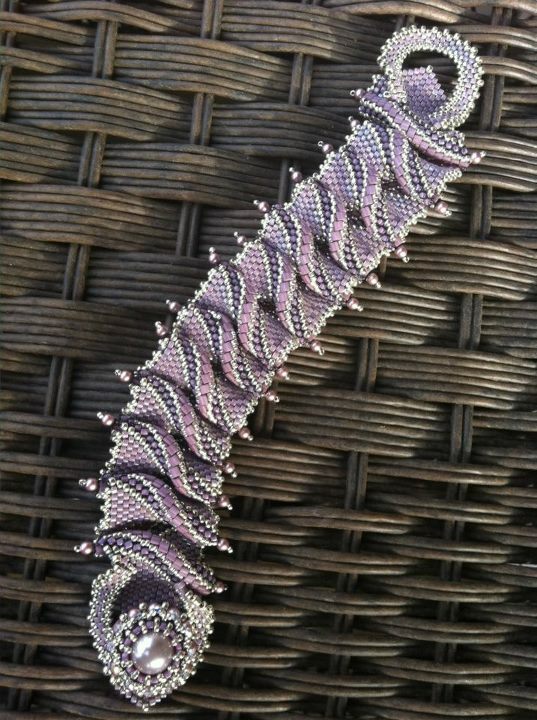 This peacock feather is done in odd count peyote stitch and bead embroidery. Pattern has the white version as well as TWO more traditional peacock colored versions! 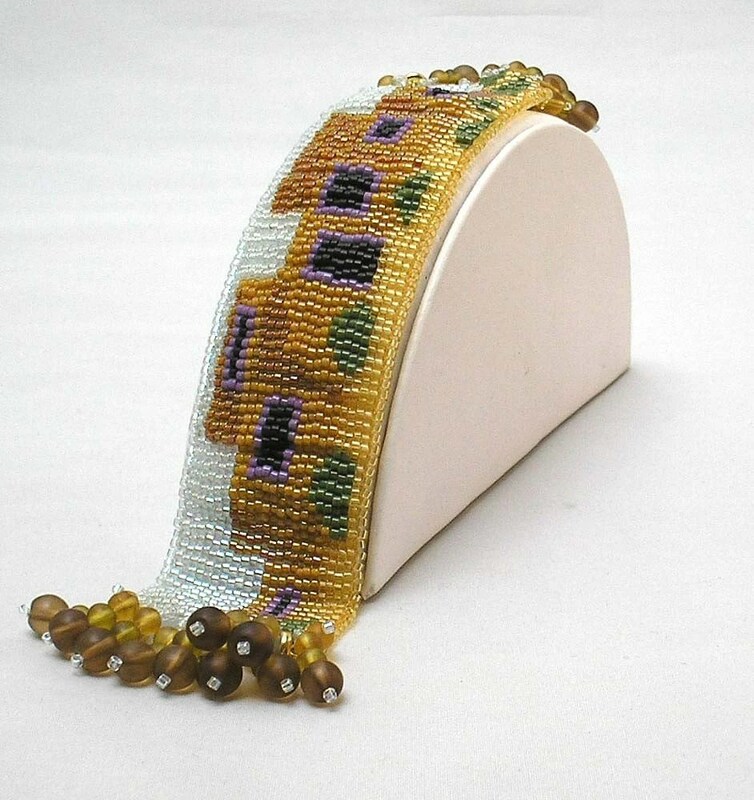 Use delicas and glass seeds to make your own version of this handbeaded toggle clasp. Swap out dagger beads for the drops for a really dramatic look. 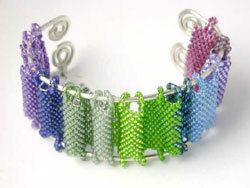 Clasp requires that you ALREADY know basic peyote stitch. 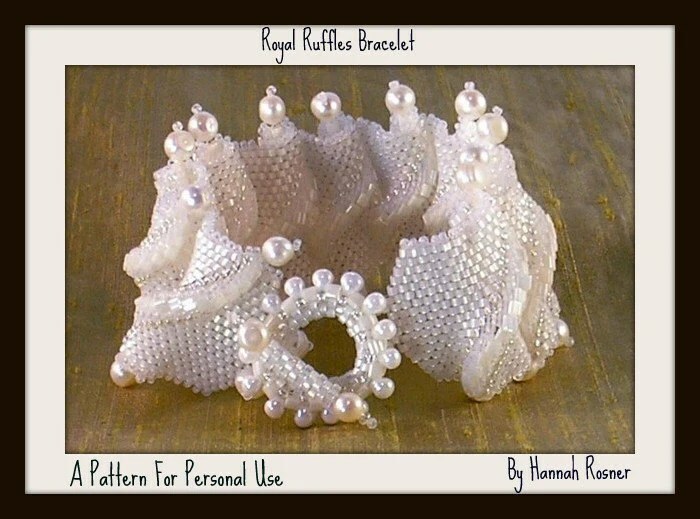 This fabulous bracelet is just even count peyote stitch, but you have to keep a sharp eye on the beads to get it to ruffle correctly. That’s the only reason I have it listed at the level it is. Students need to be really comfortable with peyote stitch. Includes toggle directions. 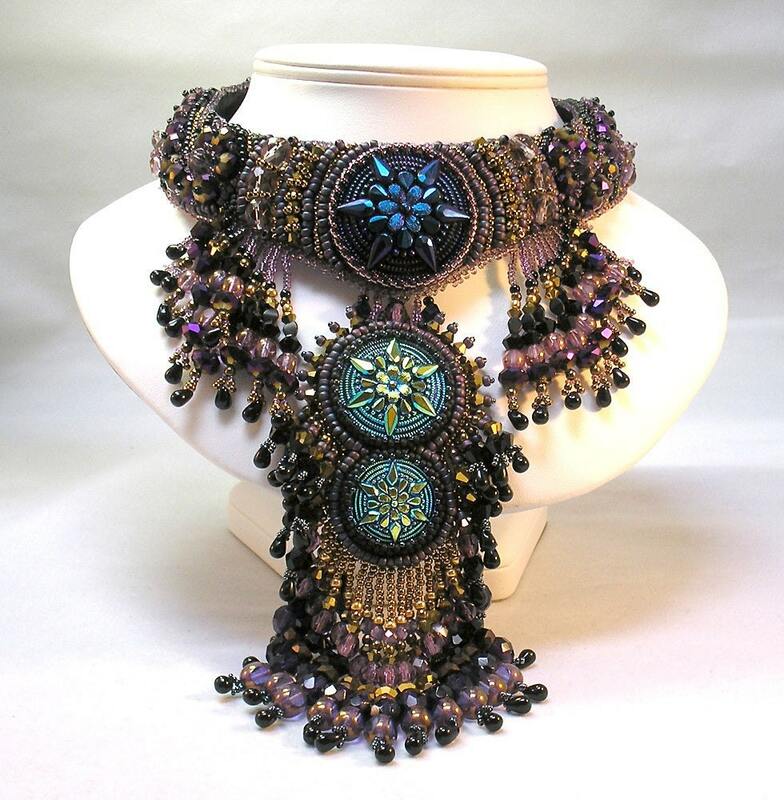 Learn to make a 3d beaded bead with all kinds of fringe. 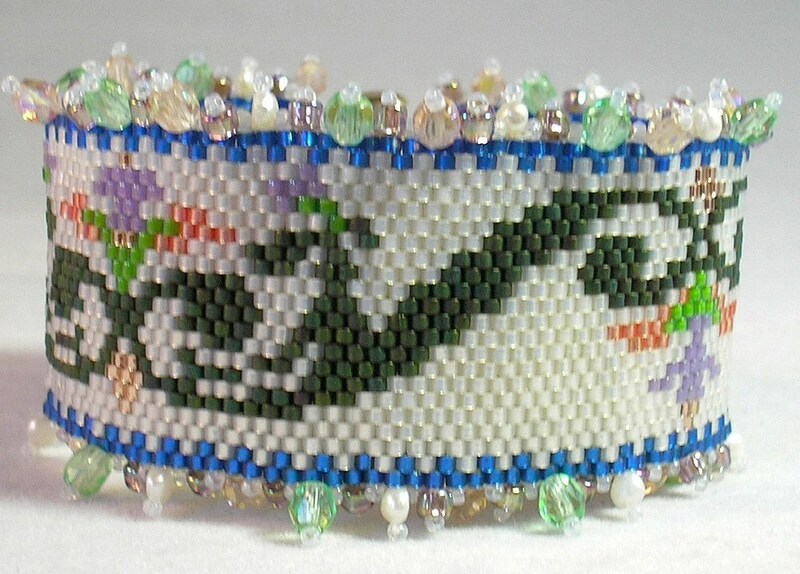 Bead requires that you ALREADY know basic peyote stitch. 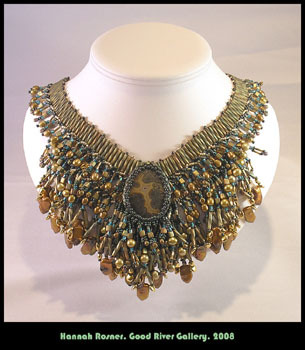 This enormous necklace is actually a compliation of a nubmer of techniques that you can use by themselves or together in a single piece. 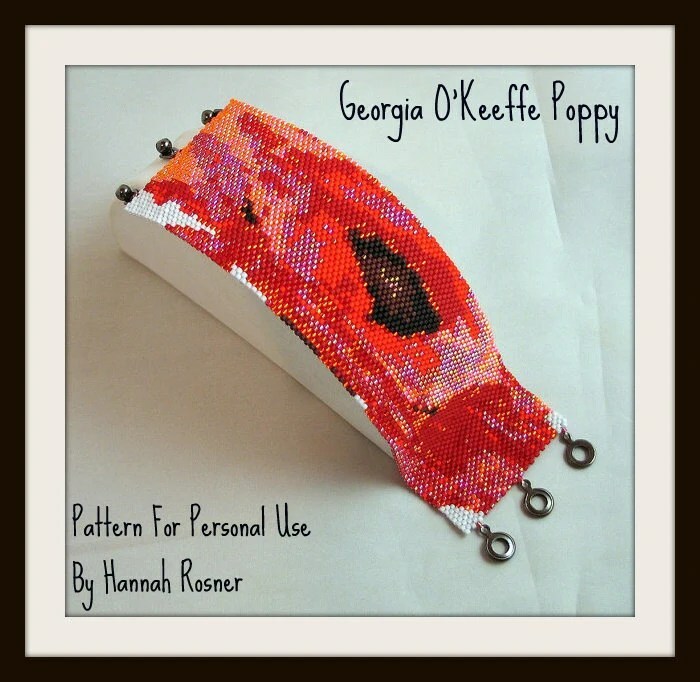 Students need to be comfortable with peyote stitch before they try this project. This project actually is pretty easy, but has a ton of spiral fringe. Students should know even count flat peyote stitch. 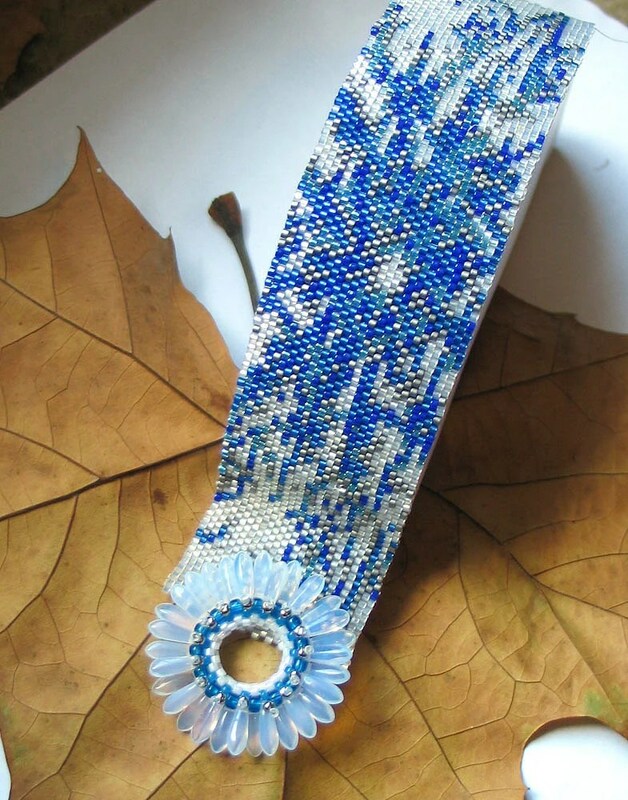 Use seed beads, Swarovski crystal and Czech glass to make this garland. 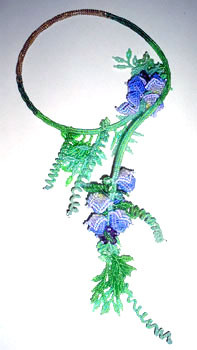 The piece can either look like sweet peas or wisteria, depending on what colors you choose. 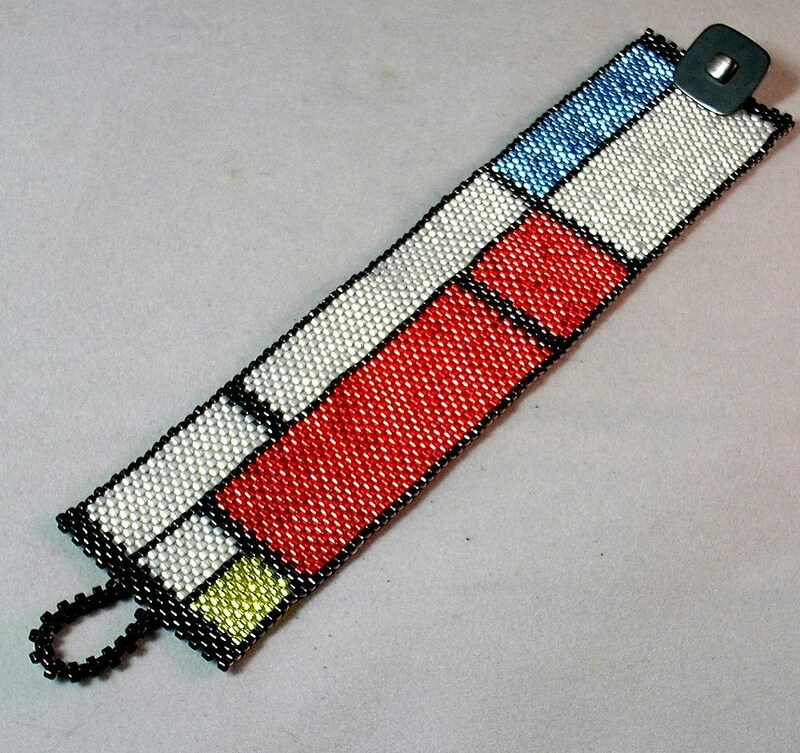 Students need to be comfortable with ndebele stitch before they try this project. This tutorial explains how to set up your shop or give it a makeover to gain hits and sales through site stats and keywords. Combine this with the online marketing tutorial for a full marketing and sales plan. Social Media Marketing is the best way to get the word out to potential customers about your products. 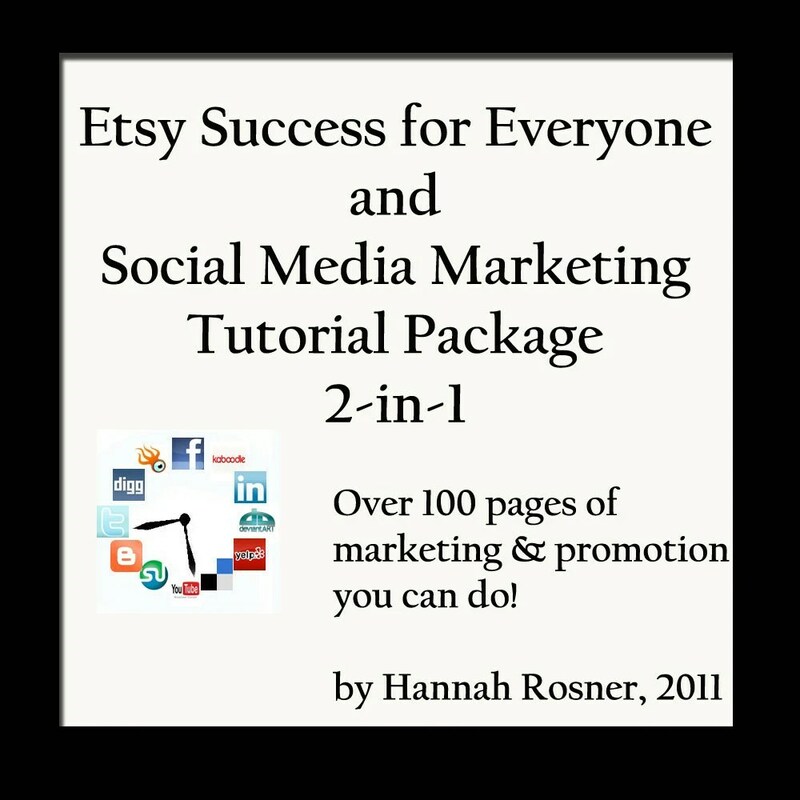 Learn how to use social media marketing to drive traffic to your Etsy or Ebay shop, or to your website. Its finally here! 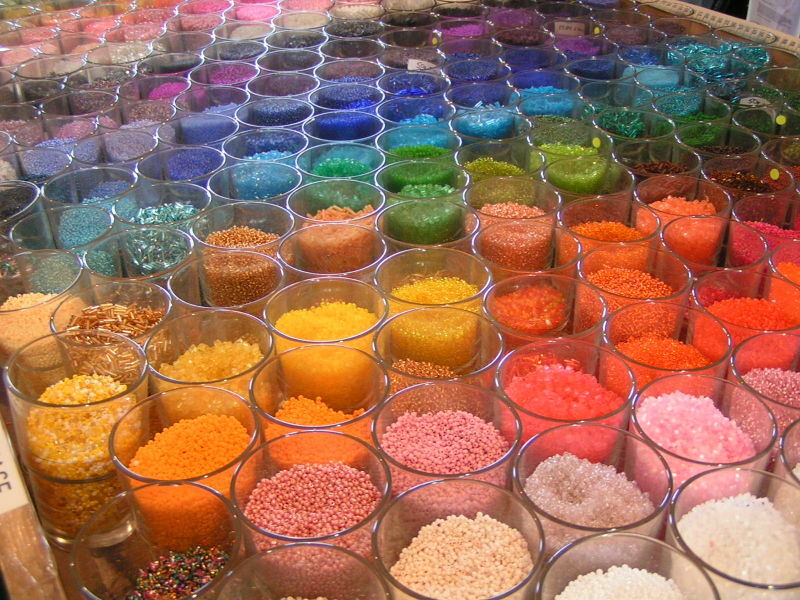 An extensive step-by-step for anyone who is considering selling bead shows or anyhow who wants to increase sales at shows you already do. 70+ pages. Will be $18, but get it now for $12! 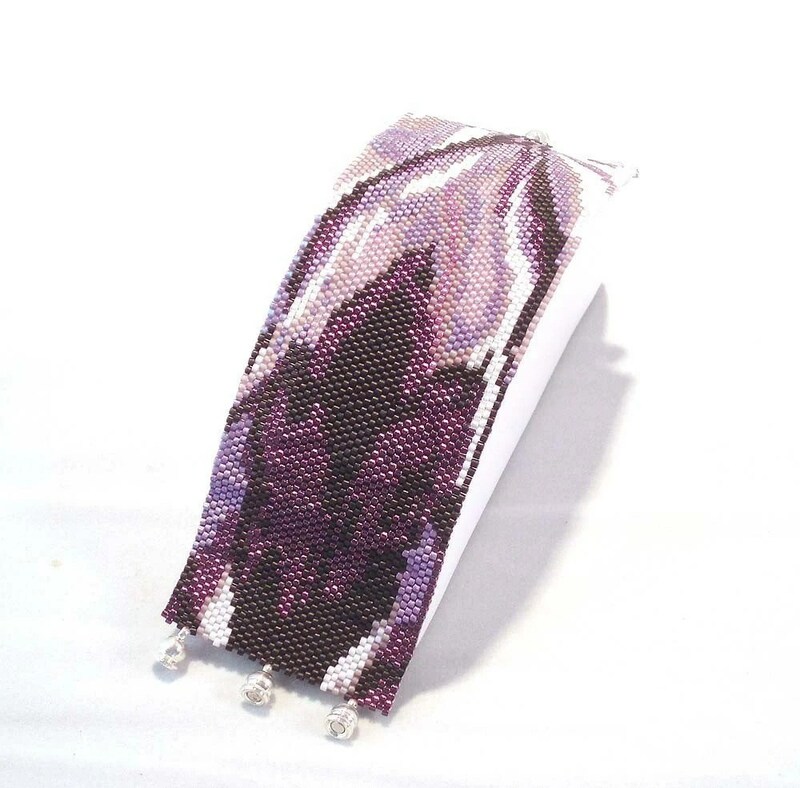 Use seed beads and brocade ribbon to make your own version of this hand beaded bracelet. 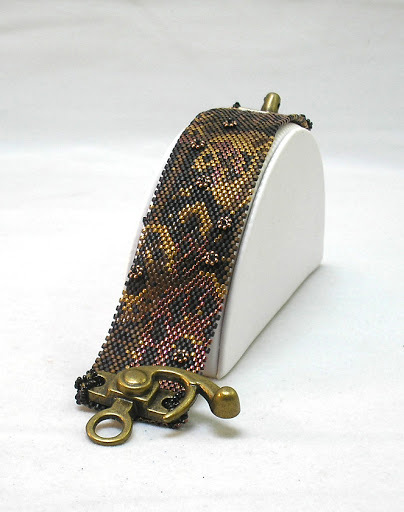 The width of the finished bracelet depends on the brocade you use. Don’t know bead embroidery? Its okay, this shows you how to do it, step by step. Want a kit? I happen to have some for sale on my Etsy here. 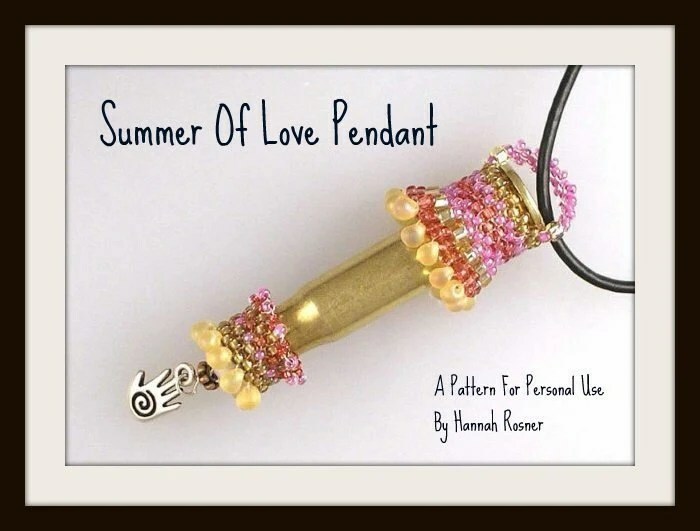 This fantastic pendant can be made with a lampwork bead of your choice, headpins and chain, and either swarovski crystal or pearls. Don’t know wirewrapping? Its okay, this pattern shows you how to do it step by step. 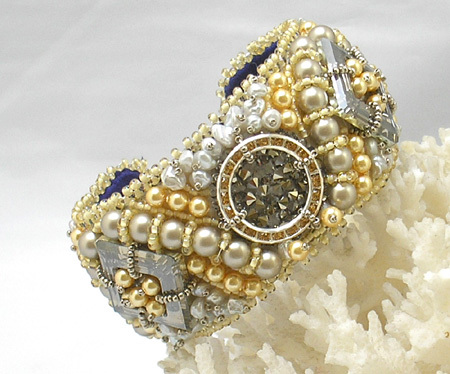 Use Miyuki Cube Beads to make your own version of this handbeaded bracelet. Students SHOULD BE ALREADY FAMILAR WITH FLAT EVEN COUNT PEYOTE STITCH before they begin this project and know how to read a peyote beading graph. I know, doesn’t look easy does it? It really is! 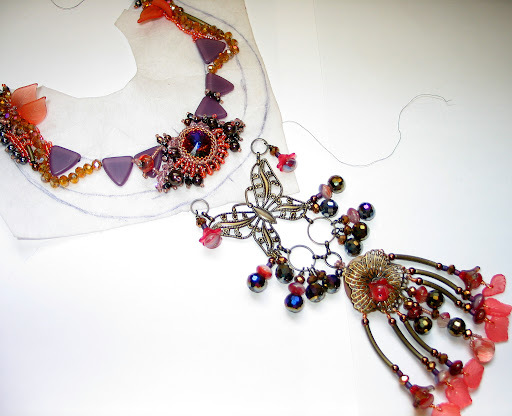 We discuss a basic fringing technique, the DNA spiral chain (its a strong finished piece, but unlike “dutch spiral” which is based off peyote/twill stitch, this is super easy), and some color theory in this tutorial, since this is not a cookie-cutter tutorial. 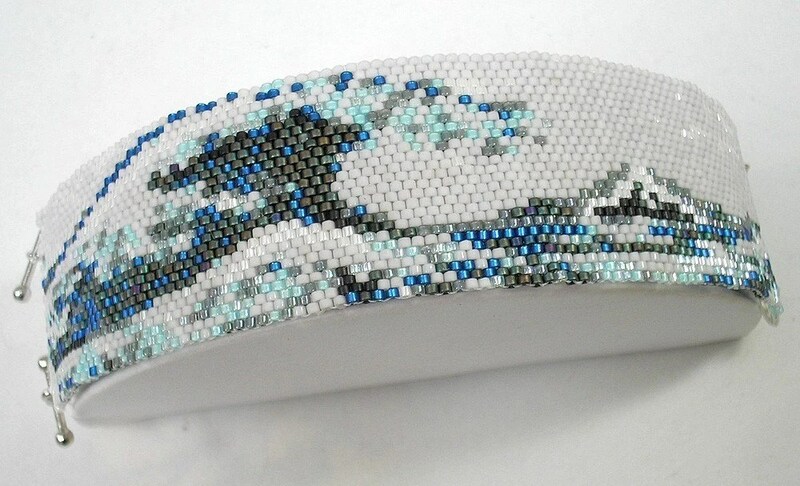 Kit includes 2 oz each of 12 premium (Japanese Seed Beads) Miyuki delica colors and 14g wire. You need to supply beading thread and some wire tools. Instructions teach basic peyote and a little bit of basic wireworking. If you have a custom color combination you want, then please email me and I’ll be happy to accomodate you. Don’t know peyote stitch? That’s okay, this tutorial teaches tubular peyote stitch and a basic fringe technique. Uses a rifle casing as the base. A beginning level micromacrame project that teaches you the very basics of the stitch but still doesn’t cost you a lot of time. 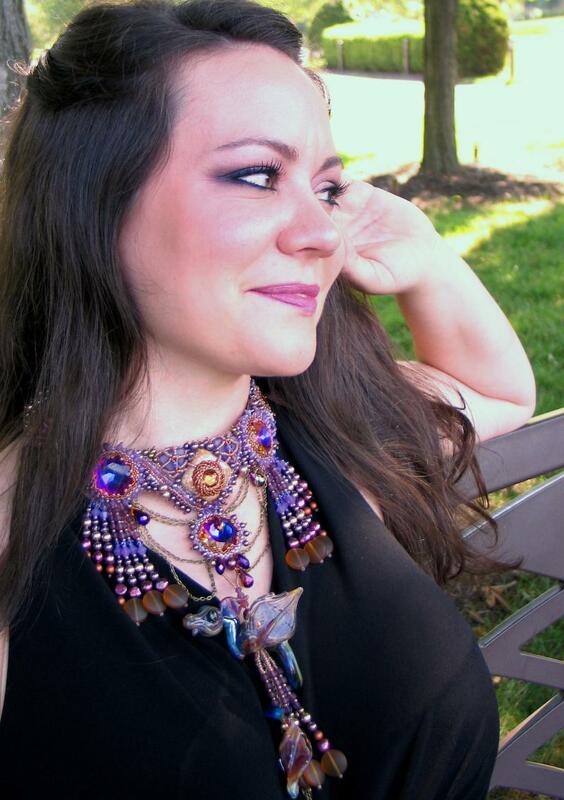 Use a lampwork bead, add some fringe and you’ve got a great focal piece! A beginning level micromacrame project that teaches you the very basics of the stitch but still doesn’t cost you a lot of time. 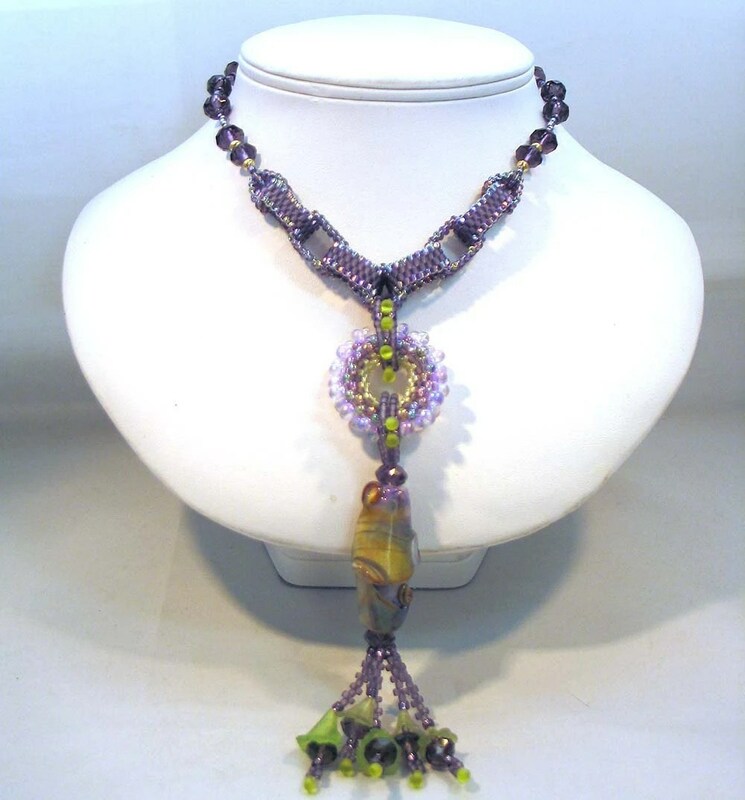 Use lampwork beads or “bling” beads for a really trendy look. 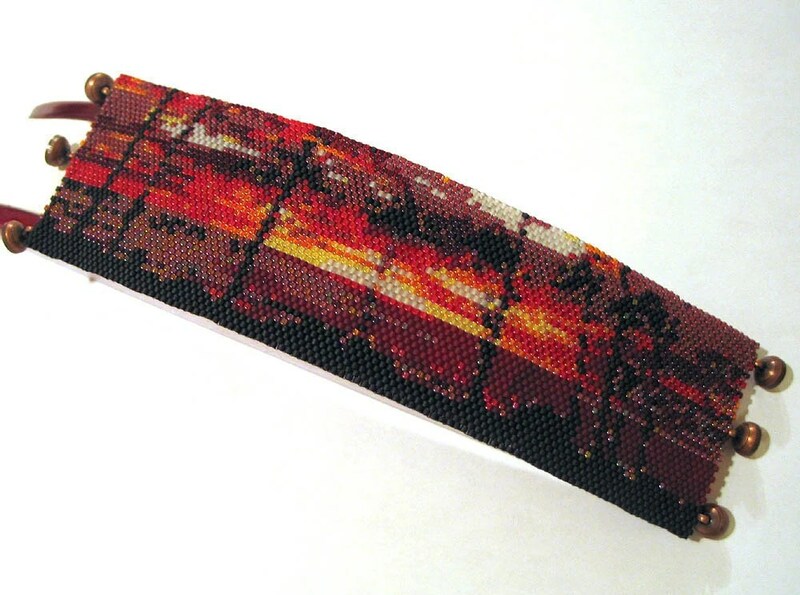 Use Japanese cube beads, Czech glass seeds & Czech pressed glass to make your own version of this bracelet. 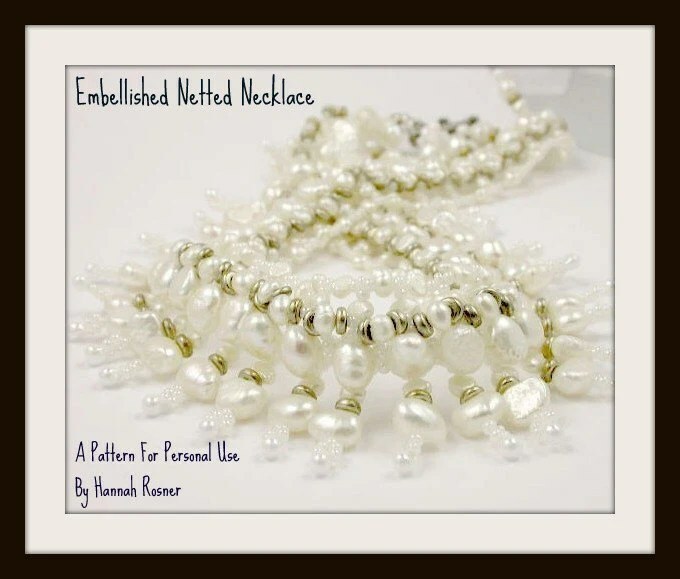 Learn how to create a complex looking elegant spider web of beads. Its actually really easy! The original netting work is an eons old technique, the fringe and the embellishment is what makes it looks so fancy. 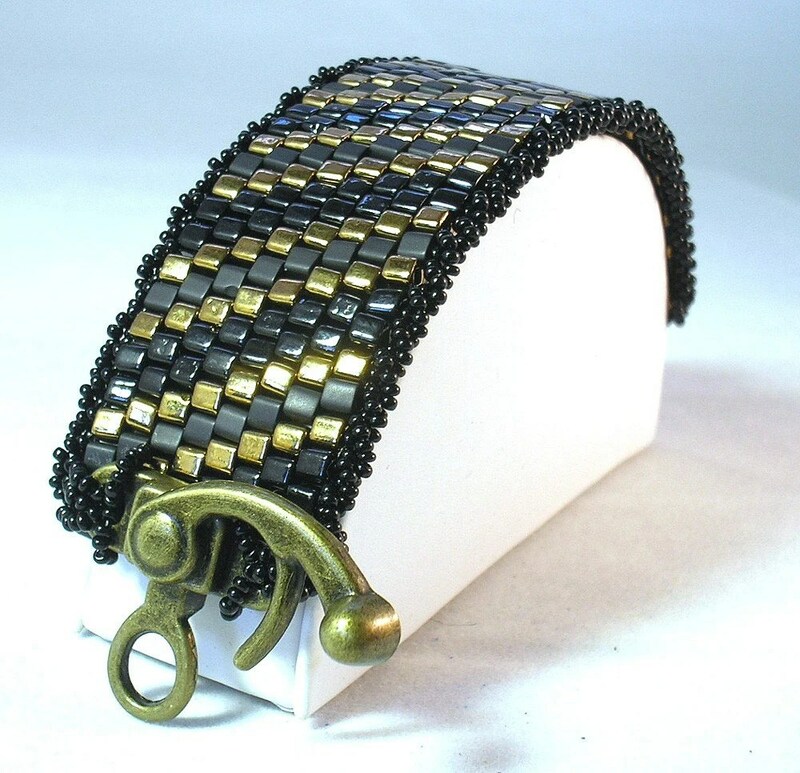 Use seed beads and leftover “bead soup” to make your own version of this handbeaded bracelet. Don’t know peyote stitch? Its okay, this shows you how to do it, step by step. 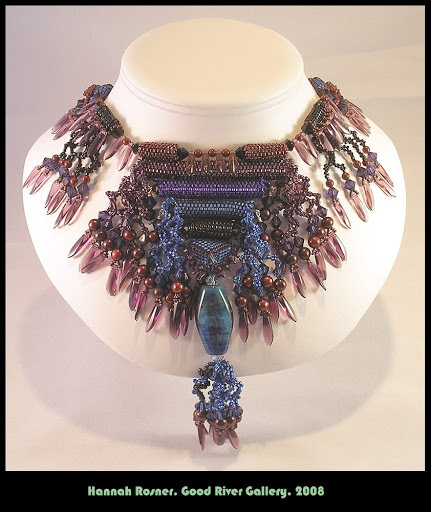 Instruction, in color, discusses the pattern and separate possibilities for clasp techniques as well as an embellishment technique. Don’t know peyote stitch? Its okay, this shows you how to do it, step by step. Instruction, in color, discusses the pattern as well as an tassel design technique. 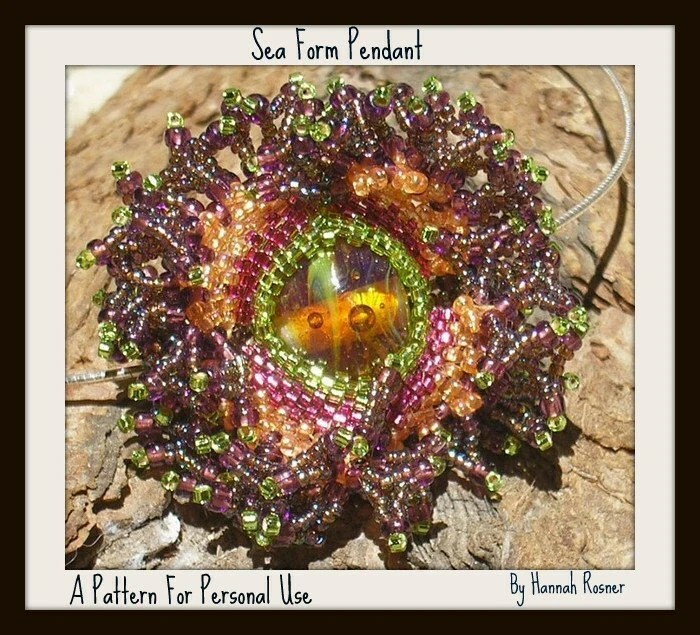 NEW – I’ve just added a peyote stitch disk option to this tutorial that will bring you right up to an intermediate level. A great showcase for a treasured lampwork bead. Don’t have one? That’s okay, I make them, just email me! Its finally here! 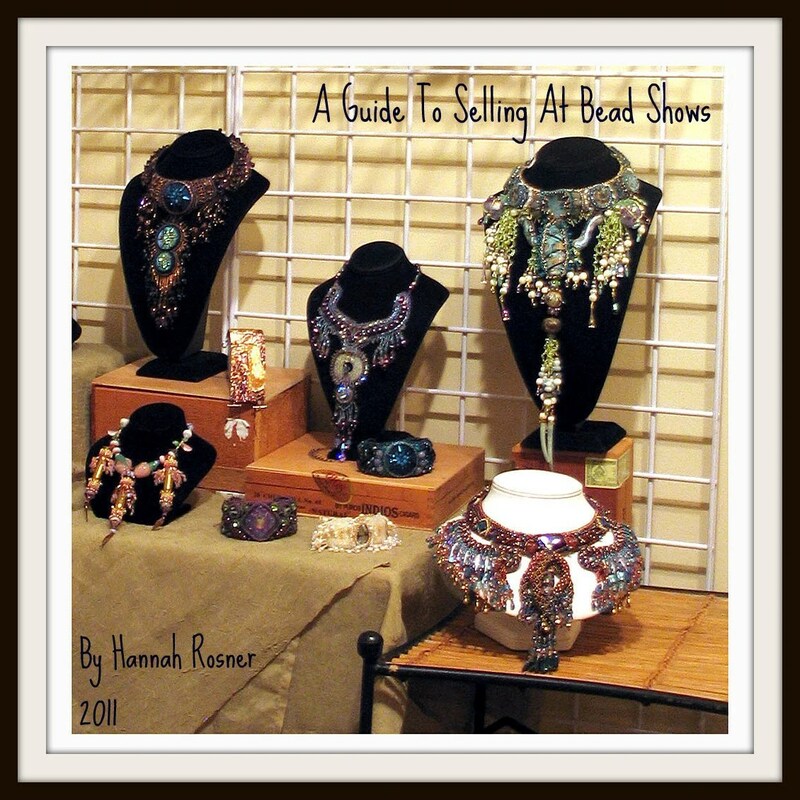 An extensive step-by-step for anyone who is considering selling bead shows or anyhow who wants to increase sales at shows you already do. 70+ pages. As an overview, I’m working on a piece that is a Bead Soup Challenge. 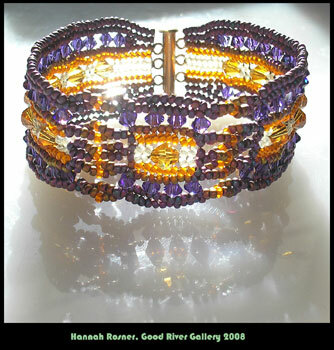 Eva Sherman from Grand River Beads sent a selection of fun beads over to Kalmbach Publishing Company and they forwarded the selection to me. Deadline is October 31st and I thought I was doing ok, but I just ran across a snag. I’ll get to it in a second. I think I’m still okay for time. Check out the links that the bottom of this posting to see where this piece started and how it is progressing. Last night, I added more wirewrapping to the base and also some more bead embroidery to the top. There was actually more fringe onthe base, but I actually removed it because it was getting too heavy and I wanted to reserve some of those cool tube beads for the side fringe. Here’s what I’ve got right now. Anyhow, so I’m not too happy with it today. I should say I like the top, and I like the bottom, but I DON’T LIKE THE TWO OF THEM TOGETHER. They look like two different necklaces. Also, those leaves still look pretty pink, even though are orange IRL. So, I think I’ll probably set aside this project and let it stew for a day or two. I’ve got orders I’ve been ignoring anyhow that I ought to catch up on. Well, I got voted off the island! I’ve signed up for next year’s Battle already! But first – I have something planned up my sleeve for the Bead & Button Bead Dreams show next June. Gotta get that done first!